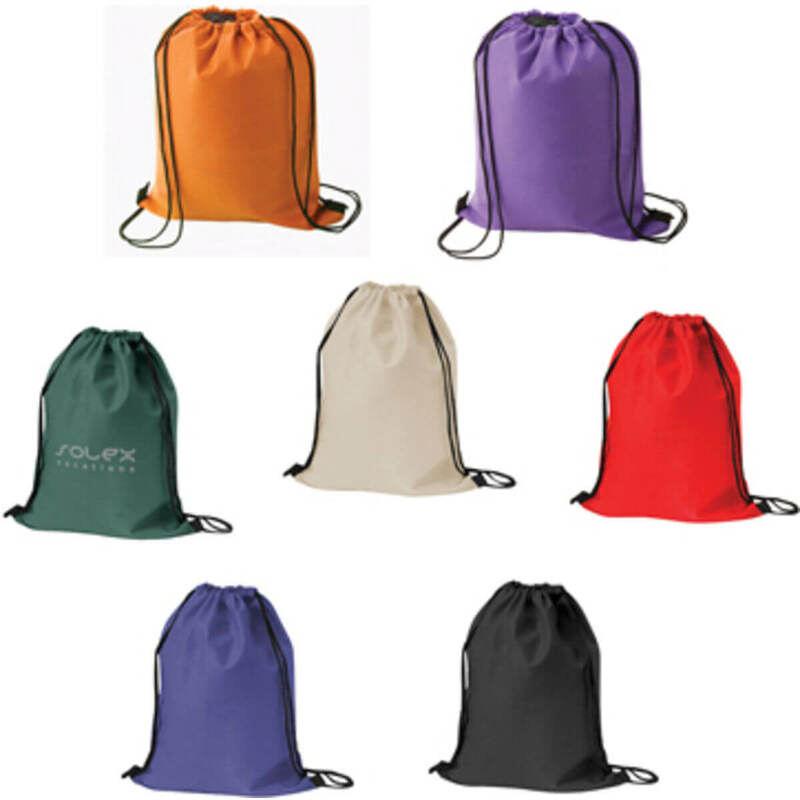 Environmentally friendly drawstring bag produced from 110g non-woven coated water resistant polypropylene. Contrasting black trims in bottom corners. Sports duffle bag produced from 600D polyester. Featuring a zippered front pocket, top closure, end compartments and adjustable/detachable non-slip shoulder strap. Jute tote shopper bag with short cotton webbing handles available in a range of colours. Large gusset and side pocket give plenty of storage space. A stylish business bag for men and women which can be worn over the shoulder or held by the comfortable handles. There is a front pocket and an internal padded section for laptops and tablets and a zip around closure. PVC sports bag with a classic 70's look with lined inner. Roomy main compartment and zipped pocket with sturdy handles, base inlay and studs for added strength. Sturdy and reliable laptop backpack produced from REACH compliant polyester. Complete with several pockets and an organiser section. Folding shopper bag matched to any pantone colour. Shopping bag which folds into a pouch with a clip. Dimensions 40cm x 41cm. Printed up to 4 spot colours on both sides. Foldable, lightweight backpack produced from durable polyester jacquard. Folds from backpack to pouch. Generous storage space and adjustable mesh shoulder straps. A versatile and stylish business backpack produced from REACH compliant polyester. Padded inner section for laptops and tablets, front pocket, carry handle and comfortable adjustable shoulder straps. Made of 600D diamond ripstop polyester, this back pack features multiple pockets, mesh water bottle holder, phone pocket, side zip and front slip. Comes with adjustable padded shoulder strap and carry loop. Durable laptop bag produced from REACH compliant polyester. Padded laptop pouch, shoulder strap, zip pocket on the front flap and organiser panel for cards/mobile phone/pens. Also a large main compartment for additional storage.